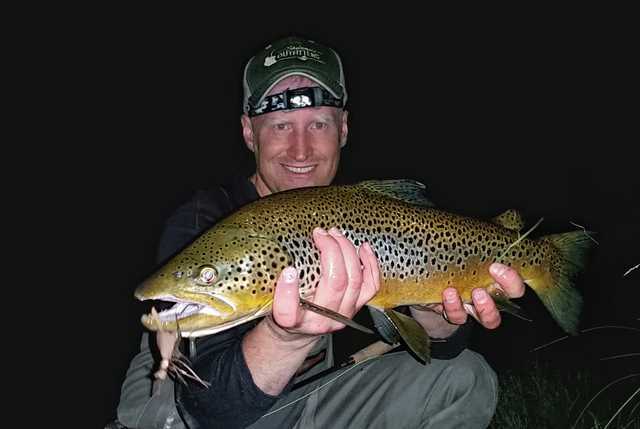 Two nights of chasing big nocturnal browns solo and connecting with a new personal best. This was the first full moon weekend of summer. The third weekend of June, 2016. Up until June the mouse bite had been slow. It just hadn't turned on yet. But after getting into some great mousing action during the darker moon a week prior [see "Mousing: 'tis the season" at troutjig.blogspot.com], I couldn't wait to get out with moonlight to see by and sling some more mice. The switch had flipped and it was time for the summer games to begin. Sometimes all the effort pays off in a big way. Those are motivating moments. They pull you forward as you anticipate when they might occur, and then they propel you into the future with renewed vigor after they've happened. All those hours of exploring spots in daytime. Casting into the darkness of night. Hours logged. Fish encounters - successful or not - filed in your mental database. You hope it will happen, you know it CAN happen, but deep inside you wonder if it ever really will. But it only takes one bite, and that bite came on my second consecutive solo all-nighter of the weekend when my mouse pattern was slurped off the surface at 2:30 in the morning. I was targeting a shoreline of big chunky rocks I've been hitting repeatedly for three years after discovering it holds solid browns. 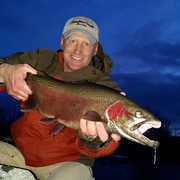 More often than not it is persistence that catches fish more than any particular technique. I knew it had to hold big ones. Over the past few years I've taken browns measuring in the low to mid twenties (inches) off it. And I'd broken a bigger one off in a lousy rookie-like hookset - I'd seen the giant brown take my offering in broad daylight and it had made a fool of me. If I had to rank my current spots for potential to produce a trophy, this one little stretch of shoreline only a couple hundred yards long would be on top. And I hadn't even fished it at night before. So I opted to take night number two, pick my way for nearly two miles along the stony and essentially trail-less river edge to get there, and cast to this one spot. 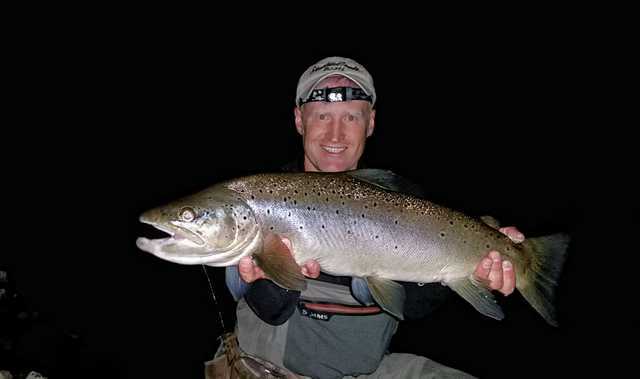 The result was likely my biggest trout to date, and certainly my biggest on a fly rod. But before that, the first night was fantastic all on its own. The hits were infrequent but solid - a typical story on a night of mousing. And browns outnumbered the rainbows. I lost two mature browns, one of which I saw clearly enough in my headlamp to have counted spots - it was very acrobatic and jumped constantly, ultimately coming off on a leap just as I finished setting up my tripod. I'd seen by flashlight that he had a pretty pronounced kype and I was wanting to get a picture of him while he was still wearing the mouse on it. This was a shoreline with ample structure and slower current - an ideal setup for tossing mice. And it stretches for over a mile before transitioning into terraced cut banks and trading the rocky structure for clay bluffs. 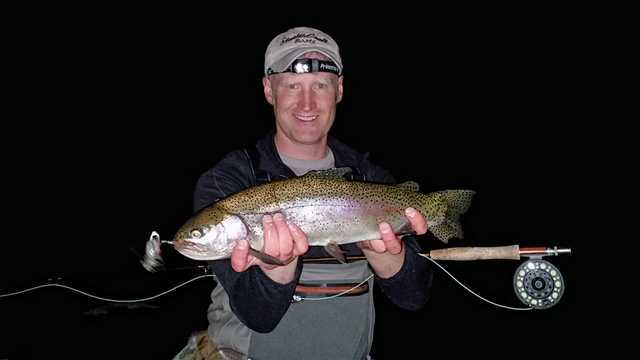 I caught fish on three different mouse patterns that night. All of the browns hit when the mouse was inches from or touching rock that extended out from the shore. They were waiting in ambush points like largemouth bass, but sitting in water you'd never find them in during the day. I managed to net and photograph three browns at or over 20 inches, two of which were particularly impressive in overall size and coloration. Two stunning browns in one night! It was such a good night. Seemingly so hard to beat. It was exactly what you hope for when working a trout water with mice. I was satisfied enough that if I didn't make it out again this weekend I would still feel fully accomplished. But then on Saturday night I chose to make that hike. Friday had been too good. It was possible to go. I could fit it in. Who needs sleep anyway? Remember, persistence. Make it happen, or it won't. The spot was gnawing at me, and it was bothering me that I was yet to ever try it in the dark when I knew it would eventually produce. So I tossed civilized common sense out the window (i.e. that I should catch up on some sleep) and worked my way to it, sometimes just walking, sometimes stopping to cast to likely looking spots along an otherwise bland stretch of river. Not that there wouldn't be fish, and I did catch a couple, but there wasn't any major structure for the browns to key in on. I generally catch rainbows in open water and the browns tight to structure - just like the daytime, but perhaps even more so. And browns were the focus. There was one vertical wall along my path, and I stopped to work it. I had a great take and completely missed. First hit of the night. Casting was more difficult than the night before. A stiff wind was blowing up river, which messes with placing the mouse and drags the line, slowing the drift. But there were calmer lulls. I pulled a rainbow from a pocket behind a lone boulder. I climbed on top of the big domed rock and drug the mouse around the perimeter, not casting at all. Jigger-poling for trout. The fish smashed the mouse and dove down alongside the boulder. I was very surprised to see it was a rainbow. But the ice was broken - one fish down. I arrived at the head of my stretch. The two hundred yards of water that I had bet my entire night on. It was now about 2:00am. The darkness of night was more than half gone. Two hours till the mouse bite, in my experience, is over. This time of year the birds start singing about a quarter to four. By 4:00am the sunlight is overpowering the moon. 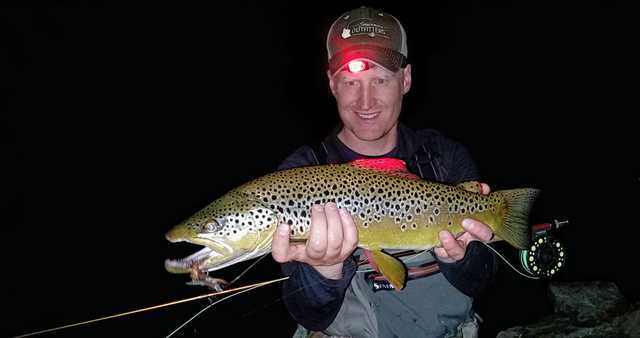 I envision that glow being the signal to the big browns: "Time to move back to the daytime holding water" - the deep craggy slot under a massive boulder - or wherever they spend their daylight hours tucked away out of reach. I worked my way through the first two runs. Prime drifts that hold fish. Narrow little pieces of holding water sandwiched between the rocky bank and the powerful downstream current that slams into the outer bend as the river rounds a corner. Foam was stacking in the eddies. They are the perfect little mouse trap, and a place where one could attempt to make it back out of the river if it'd drifted in from above. I climbed into the boulders and picked my way along to the next spots. More narrow slots of holding water, but stellar holding water. Huge rocky structure, deep water, close proximity to a dramatic current seam. All the elements right there inside a few cubic feet. Not easy to fish, and I was hoping that I'd be able to work a mouse through it well enough. The take was like any other. Nothing special, just a slurp that signals the demise of what a trout assumes is a mouse. They all sound about the same, regardless of fish size. The browns seem to hit more decisively than the rainbows - a sharp, sudden take like a surgical strike. Bam! The rainbows seem more haphazard, or maybe more hesitant. Like they mount up the gumption after they've already committed. Whoooosh! Likewise, it's usually the rainbows that are caught on the stinger hook. Of course you can't always tell, but it's something like that. If you're paying that kind of attention. In the moment, a strike is a strike, and without hooking it you never really know anyway. The fish was in control and I was just attached. It worked along the heavy current, hugging the edge of the massive rocks I was standing on. For the first several minutes the only thing I could do was follow along and reach the rod around boulders to keep the line clear and the connection direct - and just hope it didn't go around one I couldn't reach over. Being on the outer bend of the river the full power of the flow was at my feet. No wading here. It suddenly changed its mind and decided that perhaps downstream was a better option. After walking me 30 or 40 yards upstream at a slow steady pace, now it turned and blew back down and beyond where I'd hooked it. I scrambled along back down the bank, hopping over all the same boulders I'd just covered. I kept up just enough that I didn't get into my backing. Thankfully, the fish liked this side of the river. I would have been toast if it had chosen to switch. The fish put the brakes on in a great big eddy that was swirling a full 360 degrees. The remainder of the battle took place here as it went round and round this hole, twice making surges toward the main river, but for some reason - for which I'm quite grateful - never committed to. It was now that I got my first glimpse of the fish and confirmed what I already knew - it was a king-sized brown. My biggest hope now was that I would get a picture. I caught a few seconds of video footage just in case I didn't. Just a clip of proof that he was attached. The fish could have realistically been gone at any moment. SO much has to go right. 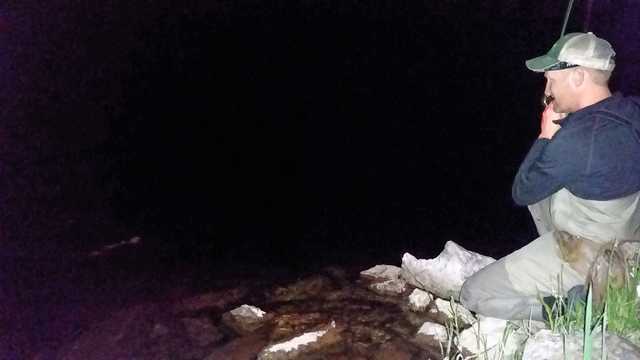 As I stood there with rod bent on the river bank alone in the dark while the rest of the world was sleeping, I tried to make peace with the fact that I might not land the fish. Chances were high that I wouldn't. I didn't know how well it was hooked. I didn't know how much abuse the tippet had taken down there in those teeth and on those rocks. But a landing was starting to look more and more likely. ﻿When I was convinced I was on the spot of the last stand, I picked out a rock to set my Joby Gorillapod on. I always set my phone camera up before the fish is landed. The phone responds to voice commands, so the only thing I have to do is lift the fish from the water, yell "shoot" a few times to trigger shutter snaps, and let it go. And hope I got myself centered in the frame! Maybe my next phone will have a full-quality front-facing camera so that I can see myself in the screen. It's always a heart breaker when a shot goes bad. 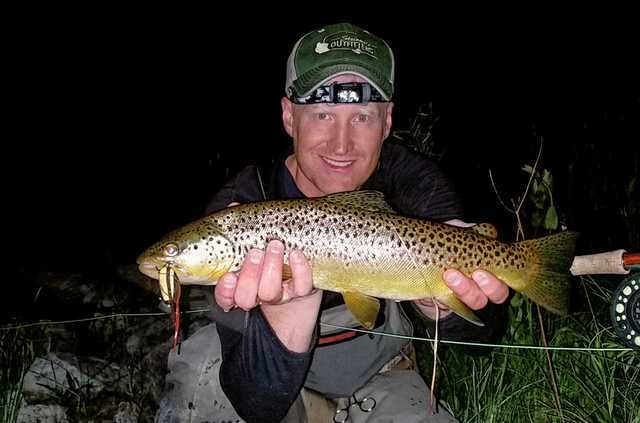 In fact, the fish I'd caught only half an hour before this brown while jigger-poling from the boulder was completely washed out by my headlamp. I had forgotten to turn it off! It seems counter intuitive to click the light off before snapping the picture, but the results are generally much better. I quickly held the fish against my rod for an eyeball measurement, then put tape to the rod after release. It easily crested 29 inches, but I can't in good conscience say with certainty that it broke 30. Maybe it did, maybe it didn't. I was in a hurry to get the fish safely back in and on its way. Being on foot and solo, I had my hands full, and I didn't want to risk killing the trout to confirm a measurement. I had my picture, and I wasn't about to lay the fish in the rocks to free up my hands for a measuring tape. The fish was certainly in a class of beast that isn't seen every day. 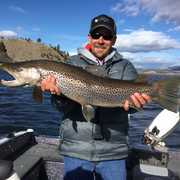 Although only 6 or 7 inches longer, it was more than double the bulk of the four- to five-pounders I'd landed the previous night. And its power was exponentially greater. After the fish swam away and had left the reach of my headlamp glow, I just stood there a while and let things soak. There I was in the apex of one of the "motivating moments." I'd been pulled forward for years at the thought of catching that fish. And now, beginning with my very next cast, I would be propelled in into the future with renewed vigor as the hunt for another one begins. I was slow to gather my stuff, get my gear in order, and refresh my tippet. I even switched flies, pocketing the one I'd just removed from the fish until I decided if it needed a special place of honor on a shelf or something. 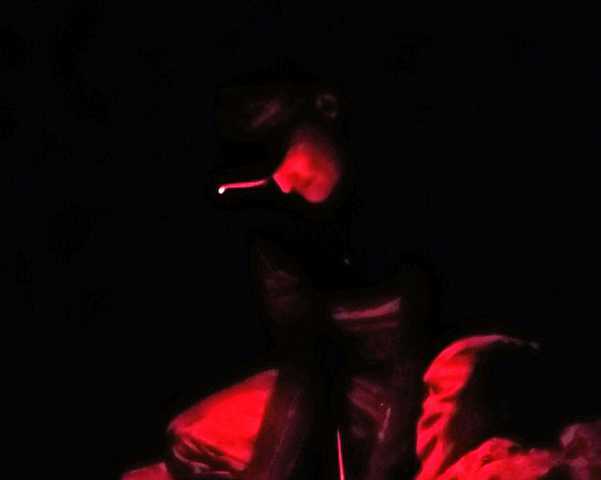 For a while I sat on a rock in the darkness and flipped through the pictures I'd just taken. There were some good ones. The catch was preserved. With that load off my mind, I stowed the camera and stared out across the moonlit river and glowing hillsides. I was so thankful I hadn't given in to common sense and gone to bed like the rest of the world. Here I was, all alone, drinking in the beauty of a scene only a fraction of the population gets to, or rather chooses to, experience. And the fish was no longer just a dream. 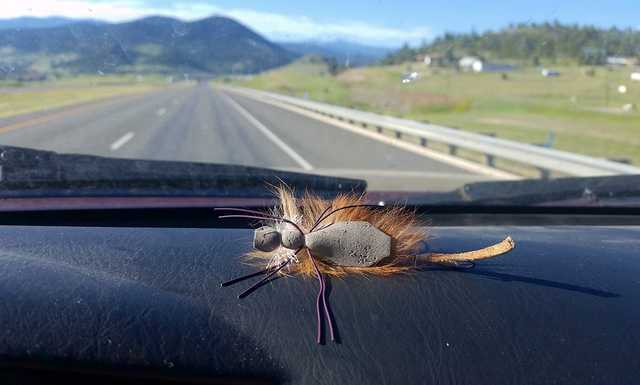 I'd connected with and landed a real brute on a mouse. I moved on a little further and took a nice rainbow sometime in the next half hour. But the birds were chirping, and I knew the end was near. It was time to hike back and maybe catch a little sleep before the day with my family began. It was Father's Day after all. On my way back I stopped once more against that vertical wall where I'd missed my first take of the night. Again he hit me - Bam! Same spot, same cast. Same results. I'd missed him again. I have to wonder how big he is. Is he just an ambitious 14-incher? Or could he pushing 30.... Browns are territorial enough that we may meet again, and now I know where he lives.